Being in the hotel business involves a lot of directional knowledge of the local Warrenton area as well as how to get to attractions outside of Warrenton, such as Washington, D.C. Many people who are travelling to Northern Virginia and Washington D.C. inquire about the National Air & Space Museum located in Chantilly, VA. The National Air and Space Museum is the companion facility to the Museum located on the National Mall in Washington, D.C. It was first opened in December 2003 and houses thousands of aviation and space artifacts spread across three levels in the museum for people to walk around and observe everything up close and personal. The museum also has an IMAX theatre, an observation deck that overlooks the Dulles National Airport, educational facilities as well as a gift shop. Some of the more notable aircraft's located in the museum are the Lockheed SR-71 Blackbird, the Boeing Dash 80, and the Boeing B-29 Super-fortress Enola Gay. The Space Shuttle Enterprise is also located at the museum in the Space Hangar section. 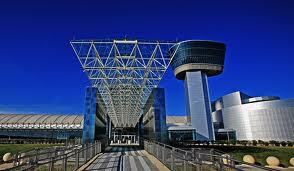 If you are looking for a way to spend your weekend, I would highly recommend visiting the National Air & Space Museum. There is a $15.00 parking fee but the admission to the museum is free and the memories you will take away after visiting this location will last forever.